This pear pie features a lightly spiced pie crust. Top the pie with small dough shapes (as pictured) or top with a whole rolled-out crust and cut steam vents. I sprinkled cinnamon sugar over the top of the pie pictured. Use good cooking pears in this pie, such as Bosc or Anjou. Combine the flour, salt, sugar, cardamom, and 1/4 teaspoon ground ginger, whisking by hand or processing in a food processor with metal blade. Add the chilled butter and cut in by hand with fingers or pastry blender, or pulse in the food processor about 10 to 12 times. The mixture should look like crumbs with some pieces about the size of small peas. If using a food processor, transfer the mixture to a large bowl. Add 4 tablespoons of the ice water. Using your hands, toss with the flour and butter mixture to moisten evenly. Add more water in small amounts until the mixture begins to clump together. Turn out onto a lightly floured surface, and with moistened hands knead a few times, adding slight amounts of water until the dough comes together. It shouldn't be too moist, but should hold together. Divide the dough evenly into two portions and shape into round, flat disks. Wrap in plastic wrap and refrigerate for at least 30 minutes. Meanwhile, prepare the filling. Peel, core, and slice the pears and toss them in a bowl with the lemon juice and zest. In another bowl combine the brown sugar, 1/4 cup of granulated sugar, 1/4 cup of flour, 1/8 teaspoon of salt, the cinnamon, and 1/4 teaspoon ginger. Toss gently with the pear mixture. Roll one disk of chilled dough out on a lightly floured surface to a circle about 12 to 14 inches in diameter. Use waxed paper or parchment paper over the dough as you roll to keep excess flour to a minimum. Fit the rolled-out dough into a pie dish. Tuck the overhanging dough under to create an edge and flute as desired.. Spoon the pear filling into the pastry- lined pie plate. Roll the second disk of pastry out. Cut out stars or other small shapes with mini cookie cutters. Place the shapes all over the top of the pie, overlapping a bit until you have the filling covered. Chill the filled pie for 15 to 20 minutes while you preheat the oven. Heat the oven to 425 F. Place a large empty baking sheet on the floor of the oven to catch spills. 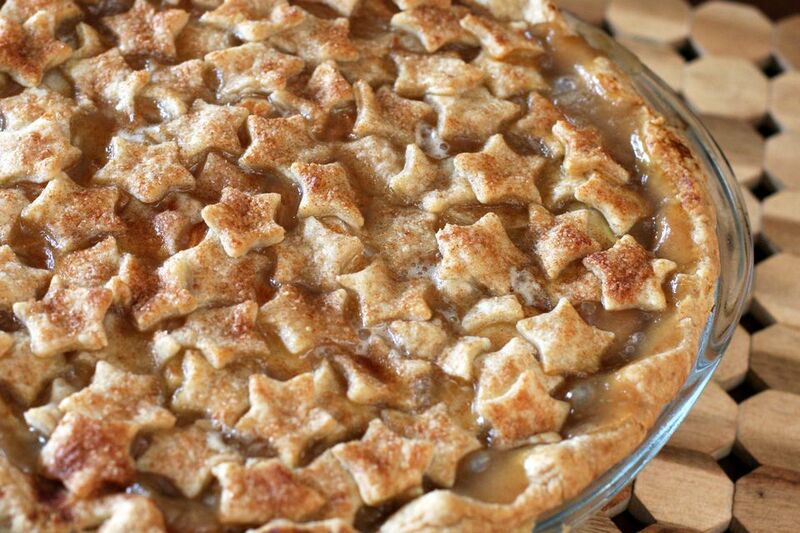 With a pastry brush, dab a little light cream over the stars and sprinkle with cinnamon sugar. Bake the pie for 20 minutes. Reduce the oven temperature to 375 F and continue baking for 30 to 40 minutes. Watch it for over-browning and tent with foil or use a pie shield or foil ring if necessary.